Polymorph is a thermoplastic material that can be shaped and reshaped any number of times. Supplied as granules. Heated in hot water - at 62 degrees centigrade, the granules form a mass of ‘clear’ material that can be shaped into almost any form. On cooling it becomes as solid. Suitable for 3D modelling, as it can be shaped by hand or pressed into a shape through the use of a mould. SMA wire also called ‘Nitinol’, as it is a composed of nickel and titanium. Looks like ordinary wire and has many of the same properties. SMA has a memory - for example, if it is folded to form a shape and then heated above 90 degrees (centigrade) it returns to its original shape. SMA can be ‘programmed’ to remember a shape. Clamp the SMA in position and pass an electric current through it. If the wire is now folded into another shape and then placed in hot water, it returns to the original ‘programmed’ shape. Thermochromic inks change colour in response to changes in temperature. These inks have serious applications such as in the food industry. They can be used to indicate when a packaged food has reached the correct temperature in an oven. They are also used in forehead thermometers. Hydrochromic inks are those that change colour when they make contact with water. A plastic moisture tester is pushed into the soil alongside the plant. 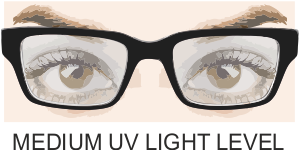 Photochromic ink darkens, as the light level increases. Some photochromic inks change colour. In fact, it is UV light that causes the darkening of the ink, which means the ink works best in natural light. This special ink has two main applications; sunglasses and spectacles. Polymers that absorb oil, forming a rubbery substance. They are environmentally ‘friendly’, developed to manage hydrocarbon-based liquid spills. A potential practical application is at petrol / diesel fuel stations. If a spill at the pump takes place, a HC Polymer can be applied, absorbing the fuel, safely. It can then be used as a solid fuel and even burned. 1. What is polymorph and how can it be used? 3. Using notes and sketches, describe a physical property of SMA. 4. What are thermochromic inks? Include a description of one practical application. 5. With the aid of notes and sketches, describe a practical application of hydrochromic inks. 6. What happens to photochromic inks when the UV level increases? 7. Aroma pigments are often used in magazines. Describe an example.